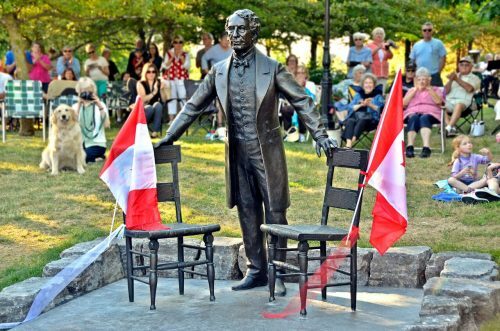 Located on the grounds of Castle Kilbride in the Township of Wilmot, the Prime Ministers Path was created to celebrate Canada’s sesquicentennial. Launched in 2016 with the unveiling of a bronze sculpture of Canada’s first Prime Minister, Sir John A. Macdonald, the Prime Ministers Path will feature each of the 22 men and one woman who have held Canada’s highest political post. All 23 sculptures will be designed by five selected Canadian artists, including local artist Ruth Abernethy of Wilmot Township. These life-size sculptures are installed at ground level, to encourage public interaction. 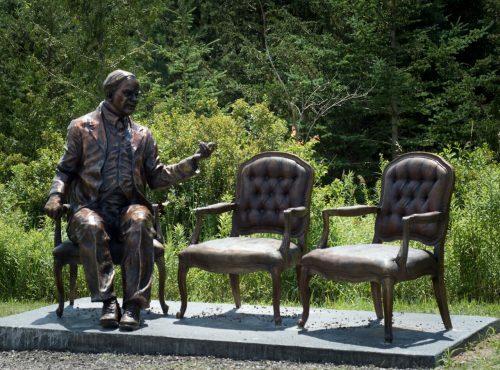 In addition, every sculpture contains “Easter Eggs”- symbols hidden within the design – that relate to each prime minister’s life. Createscapes Waterloo Region, the group behind the Prime Ministers Path, is dedicated to advancing education, arts and culture in Waterloo Region. 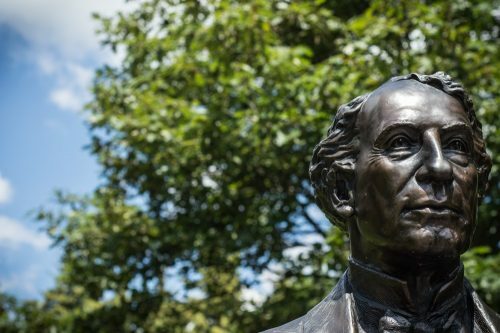 Born in Scotland and raised in Kingston, Ontario, Sir John A. Macdonald was Canada’s first Prime Minister and one of the Fathers of Confederation. His political career spanned almost half a century. During his years as prime minister, Canada experienced rapid growth and prosperity, and Manitoba, British Columbia and Prince Edward Island joined Confederation. 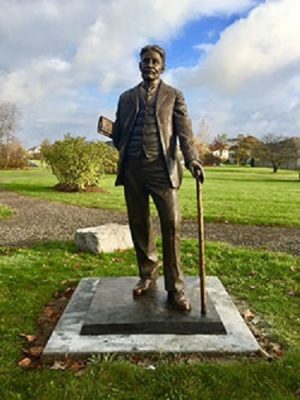 Among his greatest accomplishments while in office was the completion of the Canadian Pacific Railway’s transcontinental line, linking British Columbia with Eastern Canada. Canada’s longest serving Prime Minister, William Lyon Mackenzie King, was born and raised in Berlin, Ontario (now the City of Kitchener). His years as Prime Minister spanned half the Depression and all of the Second World War. During his almost 22 years in office, some of his greatest accomplishments included the introduction of unemployment insurance and family allowance, and the creation of the Canadian Citizenship Act. 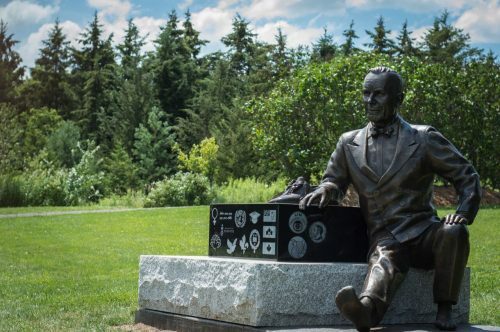 A Canadian soldier, scholar and statesman, Lester Pearson was Canada’s 14th Prime Minster. During his time in office, his government introduced the Canada Pension Plan, universal healthcare, the Canada Student Loans program and the Maple Leaf flag. In 1957, Pearson received the Nobel Peace Prize for his role in resolving the Suez Crisis. Sir Robert Borden was born in Nova Scotia and became Prime Minister in 1911. As prime minister, Borden led Canada through World War I and its immediate aftermath. During the First World War, Borden was determined to meet Canada’s wartime commitments which lead to the conscription crisis of 1917. However, this war effort enabled Canada to assert itself as an independent power, and ensured Canada could sign the Treaty of Versailles in its own right. Satisfied that under his leadership Canada had become an autonomous nation, Borden retired in 1920. He was the last prime minister to be knighted. Kim Campbell was Canada’s first and to date only female Prime Minister, the first Canadian justice minister and attoney general as well as the first woman in any NATO country to become defence minister. She is credited with enacting significant amendments to our Criminal Code regarding firearms control and sexual assault. When she became prime minister in 1993, she had more Cabinet experince than most of the eighteen prime ministers who proeded her. During her seven-month tenure as prime minister, Ms. Campbell reduced the size of the federal cabinet while adding new ministries in Health, Canadian Heritage and Public Security. In 2004, Kim Campbell was included in the list of 50 most important political leaders in history compiled for the National Geographic’s Almanac of World History. 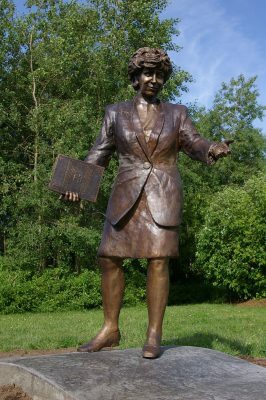 Listen to what Kim Campbell had to say about her statue!